Won't slam shut, lid is lockable. Lid made to open greater than 90"
130 Gallons, outside dimensions: 60"(L) x 24"(W) x 26.5"(H). View Lifetime 60040 Owner's Manual Sample Instructions. What is the difference between this 60040 and tent and other similar models such as 60103. 60089, 60012? The 60040 has a 130 capacity. The 60103 has an 80 gallon capacity. The 60089 has a 116 gallon capacity. The 60012 has the same 130 gallon capacity, but is different colors. Can I leave this outside all year long? Yes, absolutely. It is designed to be left out all year and will last you well over ten years. It is made to handle the elements. What types of things do people put in deck boxes like this? People put gardening items such as pots, soil, and small tools. Others throw in Frisbee's, volleyball sets, balls, baseball equipment, and more. What do I do if something is damaged or defective? If something is damaged or defective please give us a call and we will send out any parts or a complete unit if necessary. 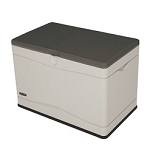 Lifetime Deck Box - 60103 Storage Box 80 Gallon Capacity: Organize your backyard, patio, or deck with this 80 gallon storage box. Lifetime deck boxes are made with high-density polyethylene (HDPE) plastic. HPDE will not fade or crack in the sunlight keeping it looking nice through years of use. Lifetime Product warranties this product for 10 years. 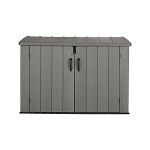 Outdoor Garbage Storage Shed Bin: This 60088 Garbage Can Storage Garage Bin is designed to make your yard look crisp and clean. 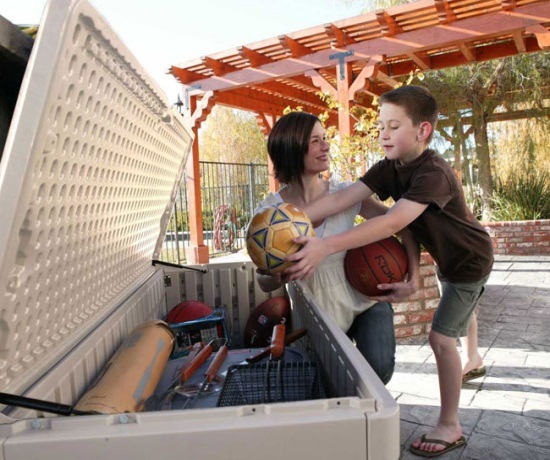 Use it to store mowers and other garage items you want to protect from the elements. 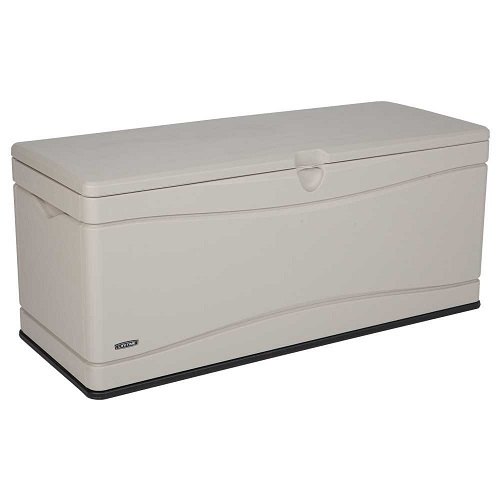 Outdoor Storage Deck Box - Lifetime Products 60012 Extra Large 130 Gallon Box:This deck box has a massive 130 gallon capacity for plenty of storage room and even allows shelves or dividers to be installed on the interior for better organization. The lid is lockable and uses a controlled spring hinge to prevent the lid from being slammed shut. We are very happy with this product -- we were looking for something long enough to store bench pads and this did it. It was very easy to assemble and looks good, very sturdy. This is our fifth one we love how easy you can put it together and how strong they are. Liked it so much, I bought another! Pros:"Well made in USA" Cons:"none" Best Uses:"Outside storage clutter" Bottom Line:Yes, I would recommend this to a friend. I found this very easy to assemble. It has great storage space and is well made. The fact it's made in the USA was a huge selling point to me. I liked it so much, I ordered another one. Best price is thru [...] at [$]. I Highly recommend, you won't be disappointed! Cons:"MAKE SHELVES AVAIL" Bottom Line:Yes, I would recommend this to a friend. QUALITY IS THE BEST WAY TO DESCRIBE. I AM MAKING 2 23.5 X 18 SLIDING SHELVES TO FIT MY NEEDS. BEST DECK BOX I HAVE SEEN! This is my 3rd unit. Shipping and packing prompt and damage free. Extremely easy to assemble. Definitely a one-man job. Precise perfect fit. No adjustments to the lid to fit. No leaks. Bottom Line:Yes, I would recommend this to a friend. Shopped all competition - this unit FAR superior. Made in USA is also keeping our tax dollars at home and Americans employed. Excellent value for the dollar; one third cost of fiberglass box. Easy one person assembly; above average quality. Anyone needing outside storage, this is the one. Q: I am using the box to store pool equipment. Do I need to do anything as far as drilling holes, for water, etc.? Q: Could u use this as a dock box on a pier? A: I'm not 100% sure what a dock box is. I think it sounds like a great idea to use on a dock to store items. It would keep them protected from the weather and you can lock it. Q: Does the Storage Box come with a floor? A: Yes, the floor is included standard. Demonstration of the 60040 Deck Box Video. Shipping time: Generally ships in 24 business hours. Ships from Utah. Takes about 5-7 days to the East Coast and 3-5 days to the West Coast. Call before delivery: No necessary. This ships FedEx. Should you notice any damage, please note it with the driver and contact us immediately. Dimensions: 61" x 25" x 8"